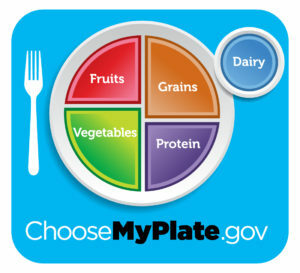 MyPlate is an easy way to remind ourselves to eat balanced, healthy meals. You’ll notice that half the plate is made up of fruits and vegetables because these should be the basis of every meal because they are packed full of nutrients and low in calories. When making half your plate fruits and vegetables, include fresh, frozen, canned or dried. TIP: Maine Harvest Bucks and Farm Fresh Rewards double your SNAP dollars when you buy local fruits and vegetables, making it much easier to shop healthy. Next comes grains, which you want to make half of the grains you eat, whole grain options. What does this mean? If you have cereal at breakfast, two slices of bread as part of a sandwich at lunch, and rice with your evening meal, half of those foods should be made of whole grains. You could choose to have whole grain cereal such as shredded wheat and brown rice for dinner. Or you could have 100% whole wheat bread for lunch and have air popped popcorn for an after dinner snack. The last part of the plate is protein, where you are looking for lean (or low-fat) options and a variety. Your first step is to choose options that are low in fat such as 90% lean ground beef instead of 80%, or cuts of meat with the word round or loin. Next, mix up your protein foods to include seafood, beans and peas, unsalted nuts and seeds, soy products, eggs, and lean meats and poultry. Plant-based proteins such as beans, lentils, peas, nuts and seeds are low cost options for protein. Just outside of the plate is a glass of dairy.Dairy products such as milk and yogurt are high in nutritional value and relatively low in cost. Look at the unit price tag to select the size container that will best meet the needs of your family. Only go shopping once per week because you know if you just go to the store for milk and bread you will walk out having spent $50 on things you didn’t need and have forgotten to buy the milk and bread. Avoiding foods that contain more than five ingredients, artificial ingredients, or ingredients you can’t pronounce. You’ll likely be able to make that item from scratch and it will cost less. Look at the unit price tag. To learn more about this, be sure to check out our “Finding the Best Buy” page. Need a place to start? We have created 4 weeks worth of low-cost menus with grocery lists! Save time by cooking when you have time, making extra and freezing for later. Keep things simple – soups and stews are all-in-one meals! Learn to love leftovers to save time and money!